WISDOM Base. This phase includes the analysis over the entire territory of the study area. Woodshed analysis. This second phase of the analysis uses the result of the WISDOM Base to delineate the sustainable supply zone of selected consumption sites. Depending on the scale and objectives of analysis, the selected sites could be urban centers, rural villages or existing/planned biomass plants. The specific steps of analysis are summarized below while a graphic overview is shown in Figure. The application of the standard WISDOM analysis producing supply and demand balance mapping at the local level involves five main steps. Definition of the minimum administrative spatial unit of analysis. Development of the demand module. Development of the supply module. Development of the integration module. 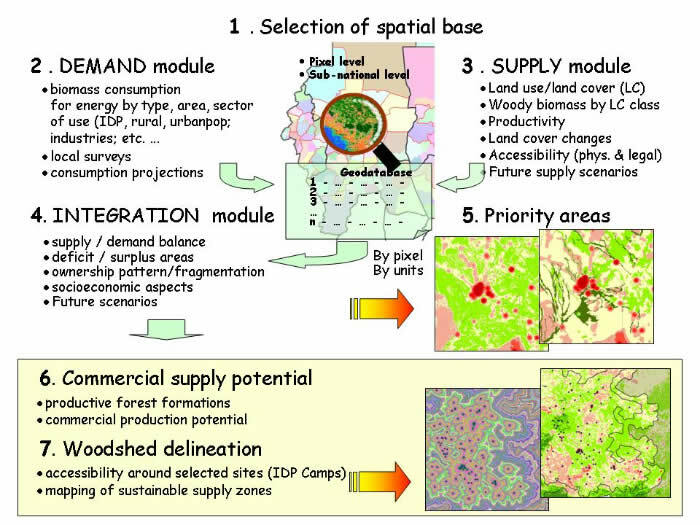 Selection of the priority areas or woodfuel “hot spots” under different scenarios. The analysis for the delineation of woodsheds, i.e. supply zones of specific consumption sites requires additional analytical steps that may be summarized as follows. Mapping of potential “commercial” woodfuel supplies suitable for urban, peri-urban and rural markets. Definition of woodshed, or potential sustainable supply zones, based on woodfuel production potentials and physical accessibility parameters.